Thanks to everyone for sharing your favourite thoughts and highlights of Montreal. If you haven’t visited the site since the last post was uploaded, please take a moment to check out everyone’s contributions in the “Comments” tab at the beginning of the last post. This week, as promised, I’d like to focus on the sweeter side of Montreal, the city where Chocolatour was officially launched back in October of 2009. 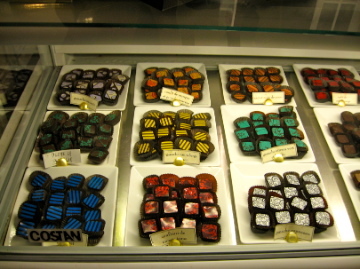 There are a plethora of excellent chocolate bistros around the city that not only offer a tempting selection of handmade fresh chocolates to take home, they serve sensuous chocolate creations that can be the main focus of your meal or the perfect ending by way of a make-you-squeal dessert. I really enjoyed lunch at Juliette & Chocolat located at 377 Laurier Ouest. The atmosphere is perfect for lunch with the girls, and the menu offers some really unique offerings such as the chocolate salad! 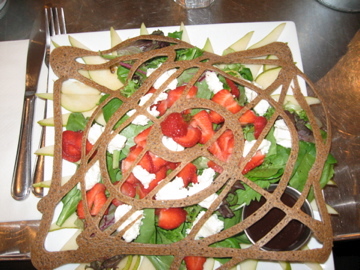 The Juliette & Chocolat Salad is served with seasonal fruit, and goat cheese with buckwheat crepe slices, topped with a chocolate raspberry vinaigrette. Delicious! Juliette & Chocolat is also famous for its drinking chocolate, offering an exotic list of chocolate origins to choose from. 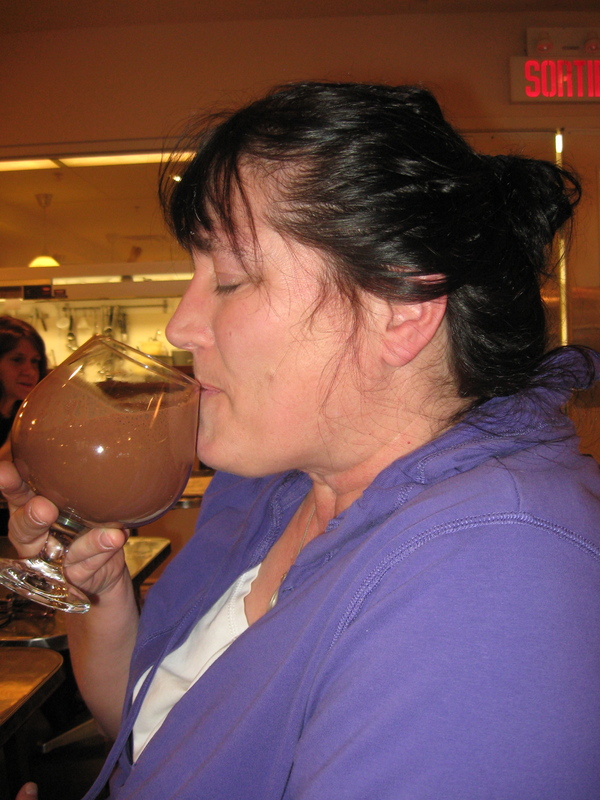 This picture of a friend enjoying her drinking chocolate tells the story of complete satisfaction. The chocolate selection is lovely, too, and take time to peruse the “Chocolate Bars” on the menu which provide interesting tidbits about chocolate and cocoa around the world. This is truly a place for chocolate lovers! I also enjoyed chatting with chocolatier, Marlain Jean Philippe, owner of Marlain Chocolatier, located at 21 Cartier in Pointe Claire, a suburb of Montreal. The small shop is located in a historic house and don’t be surprised if you’re welcomed by the ear-to-ear smile of the proprietor when you walk in the door. He is French-trained (in Paris) and carries the designation of Maitre Chocolatier-Confiseur, so you know that he knows his chocolate! I absolutely loved the Obama chocolates made from soft nougat, pineapple, ginger, coffee beans, almonds and the finest dark chocolate. They had an amazing flavour and texture that I shall always remember. And Marlain doesn’t stop at edible chocolate! He offers an assortment of cocoa-based creams and cosmetics to make your body as smooth and silky as the delectable chocolate he’ll box for you to take home and savour. 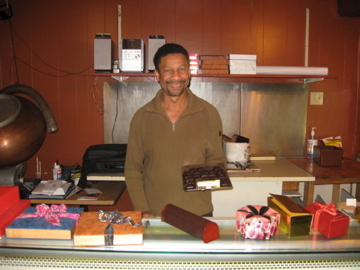 There are many other exquisite chocolate shops in Montreal. What are some of your favourites? Please join us back here the week of September 12th, when we’ll enjoy more taste-tempting travels. Montreal has an important place in my heart as it is the place where the research for my book, Chocolatour, was officially launched! Fellow chocolate lover, Kathe Lieber of Montreal, accompanied me on the first overseas chocolate research trip back in October, 2009. Hard to believe it’s nearly been two years of chocolate tasting that has gotten me to this point! But before we boarded the big bird and flew to Brussels, Kathe took me on a journey of chocolate discovery in Montreal. I’ll share some of our findings in the next post on this blog. For now, I’d like to focus on the city itself, as Montreal is such an amazing metropolis that as sweet as it is, chocolate will have to wait its turn for our attention. Being a travel writer has its perks and privileges. It also instils some wonderful habits that come in handy. I looked thru my mini-notebooks that diarize my travels and found the one dated May 26-June 3, 2001. It had been exactly 10 years since my last visit of any length had been to this great city! At that time, I had the great privilege of staying at two terrific hotels, one so very different than the other. 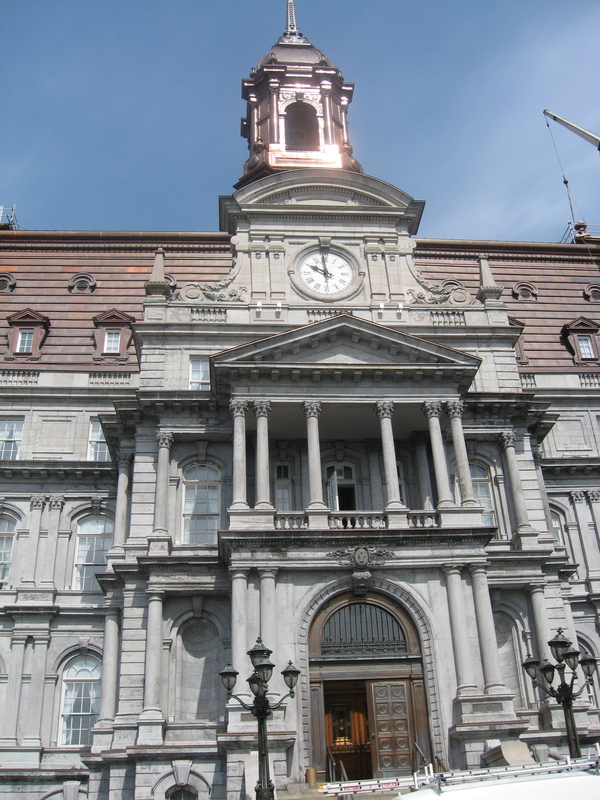 The two properties personify the two distinct personalities of Montreal: the modern, chic French-speaking metropolis of North America, and the charming “Old Montreal” where you’ll find numerous reminders of the four centuries that make up the city’s rich and colourful history. The Hotel Le Germain on Mansfield, is situated in downtown Montreal, a close walk to the bustling shopping street of St. Catherine and to McGill University. If you are looking for a chic boutique hotel with impeccable service, this is the place to stay. We also enjoyed being the guests of suite 501 in the beautiful historic, Auberge Bonaparte, a lovely room with an outdoor terrace complete with fresh flowers. What a romantic place to have spent our 6th wedding anniversary! And what a location. If you’re looking to stay and play in the heart of Old Montreal, the Auberge is a terrific choice. 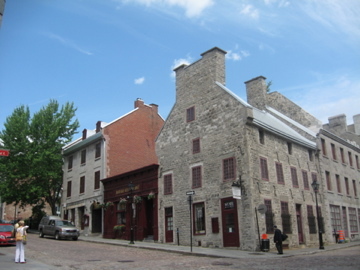 Rue St-Francois Xavier in Old Montreal is home to the Auberge hotel & restaurant, as well as a terrific museum. On my trip in June of this year, I stayed at the Residence Inn, a Marriott property offering reasonable rates and a convenient location to Concordia University, where the PWAC conference was being held. It’s not as luxurious as the other properties I’ve cited, but it has spacious rooms with full kitchen facilities and is perfect for lengthier, or more informal stays. Writing this post has made me realize that I must get my beautiful slides from the late 1990’s and early 2000’s put onto disk. Right now, they’re in boxes in the garage just waiting for me. Please join me here again the week of August 29th, when we’ll look at the sweeter side of Montreal. Until then, please share your comments about your favourite place(s) to stay in Montreal. As well as other things you love about the city. And if you’re looking for more information on this remarkable city, visit Tourisme Montreal where you’ll see a totally cool video.